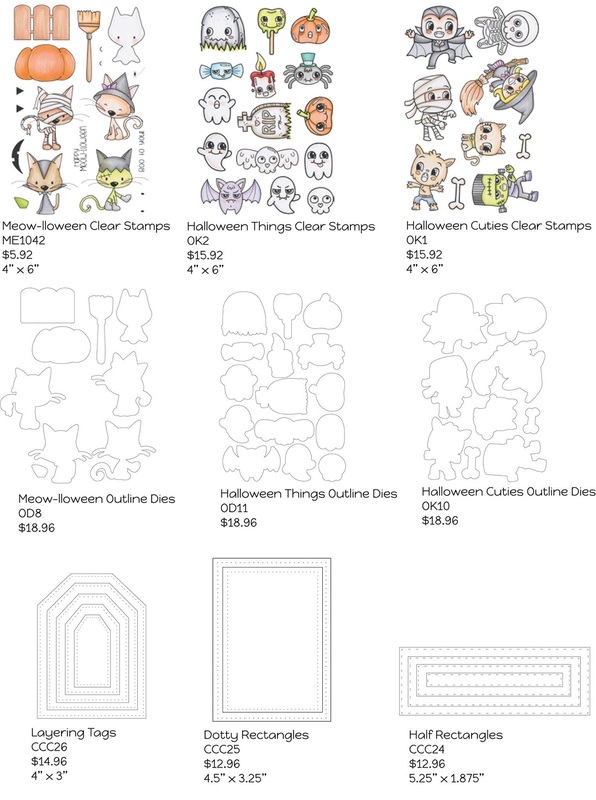 sets with coordinating dies available for purchase, Layering Tags Die, Dotted Rectangles Die, Half Rectangles Die, and Shadow Spots Die. I stamped the witch from the Roberto’s Rascals Monster Mash Set in Momento Desert Sand ink and coloured her up with my copic markers, I then die cut her out with the co-ordinating die set. On a piece of heavy weight white cardstock I cut a panel from the Dotty Rectangles set and used a circle mask to create the background, the sentiment comes from the same Monster Mash stamp set. I attached that to a black panel and popped it all up on a purple panel. And we can’t have a Blog Hop without a PRIZE!! Here’s how to enter:Leave a comment on each DT Member’s Blog, and then head back to the C.C. Designs Blog to let us know you completed the hop. There is a $25 CCD Store Gift Certificate hidden on one of our Design Member’s Blog so you definitely want to comment on each blog. 🙂*This Blog Hop will end on Sunday, August 7th at NOON, 12pm EST. Winners will be announced the following week. Don’t forget to also comment on each CCD PREVIEW DAY Post for a chance at winning a $15 CCD Store Gift Certificate. Awesome coloring and background on this cute card! Love that cute stamp! This is a cute card. I love the image and the coloring. Especially her hair. Great sentiment. Ack! So darn cute and beautifully colored. I’m such a fan!! You have made a perfect card! Fantastic coloring, choice of color and I just love the background. It’s stunning. I wish I could do the same. Cutest witch ever, and love the background you made for her!! She is so cute. Your card is terrific.